If you prefer to see and experience our amazing products up close, visit our hearth showroom right here in southern Indiana! The space is designed to give you the full hearth experience and features beautiful, fully functional fireplace displays! 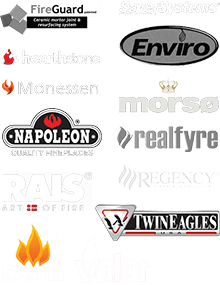 In our showroom, you’ll be able to shop the latest trends in fireplace, stove and chimney design from award-winning, leading manufacturers like Napoleon, Buck Stoves, R.H. Peterson, Monessen, Hearthstone and more! You’ll also benefit from the assistance of our knowledgeable and friendly hearth experts, who are available to answer any questions you may have and help you make the best choice for your hearth project.  Stop by and see us today and discover why Olde Towne Chimney is the #1 choice for quality hearth products in the southern Indiana and Louisville, KY area! If you have any questions or need directions, please feel free to call us at 812-284-0123! Once people know about us, they come from all over our service area to talk with us and see our great product selection for themselves.